Vimana Private Villas (a luxurious residential project by Robinsons Land Corporation) is an exclusive townhouse community along Saint Martin Street in Barangay Oranbo, Pasig City. 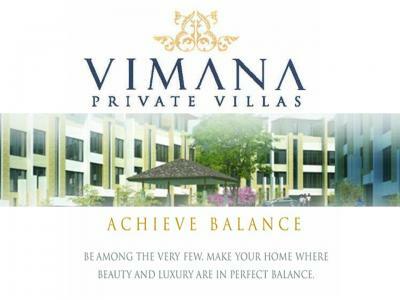 Vimana means “a sanctuary of a Brahman temple” and the 30 townhouse units have a tropical, Asian-inspired design. Each four-storey townhouse unit will have a minimum gross floor area of 230 square meters, with a standard floor area of 82.50 – 86.25 sqm. There is enough space between rear buildings which gives you and your family allow natural lighting and air circulation. At the Vimana Private Villas, selected units will face towards the central garden, and some units will also be suited with balconies which highly complements the Asian earth-toned finish of the building exterior. Each unit will have 5 bedrooms including a master bedroom, 3 other bedrooms and a maids room. Please note that prices are subject to change without prior notification. At the Vimana Private Villas, you are at the center of all because you are just minutes away from top notch schools and universities (La Salle Greenhills, Poveda School), world-class medical facilities (Medical City, VR Potentiano Medical Center), Business and Shopping malls (Shangrila EDSA Hotel, Crown Plaza, Holiday Inn, EDSA Shangrila Mall, SM Megamall, The Podium, Starmall, St. Francis Square, Robinsons Galleria Mall, and Greenhills Shopping Center).